In South Florida, unlicensed (pirate) broadcasters have been a frequent source of trouble in terms of interference and diminished coverage, direct competition for advertisers’ dollars, and even compromises in the EAS and other key systems. These unlicensed operators are frequently found related to drug activities and other related criminal activities. Case 1 - Mr. Whistler Fleurinor, who was operating on 99.5 MHz. in the Fort Lauderdale area, was sited by the FCC for operating an unlicensed radio station and issued a Notice of Apparent Liability for $20,000.00 on March 7, 2011. On March 16 and August 24, 2010, in response to complaints about an unlicensed station on 99.5 MHz, agents from the Enforcement Bureau’s Miami Office (“Miami Office”) used direction-finding techniques to locate the source of radio frequency transmissions on the frequency 99.5 MHz to a commercial property in Fort Lauderdale, Florida, which according to Florida property records is owned by Mr. Fleurinor. You can read more about this NAL - Whisler Fleuerinor - Fort Lauderdale, FL . Also see below. Case 2 - Mr. Christopher M. Myers, who was operating on 91.7 MHz.and 95.9 MHz. in the Lauderhill area, was sited by the FCC for operating an unlicensed radio station and issued a Notice of Apparent Liability for $10,000.00 on September 9, 2010. You can read more about this NAL - Christopher M. Myers - Lauderdale Lakes, FL . Also see below. Case 3 - In partnership with FCC, the Broward Sheriff’s Office served a search warrant on October 7, 2010 at a home located in Lauderdale Lakes, and arrested two occupants. Detectives found the hub of the pirate station – a small table with a laptop, cell phone, audio mixer, two microphones and a computer attached to a large antenna on the roof. The unlicensed station was operating on the frequency of 89.5 MHz. and called itself 'Trap Radio'. You can view the Broward County Sheriff's action as it arrest these individuals and decommissions the illegal station. 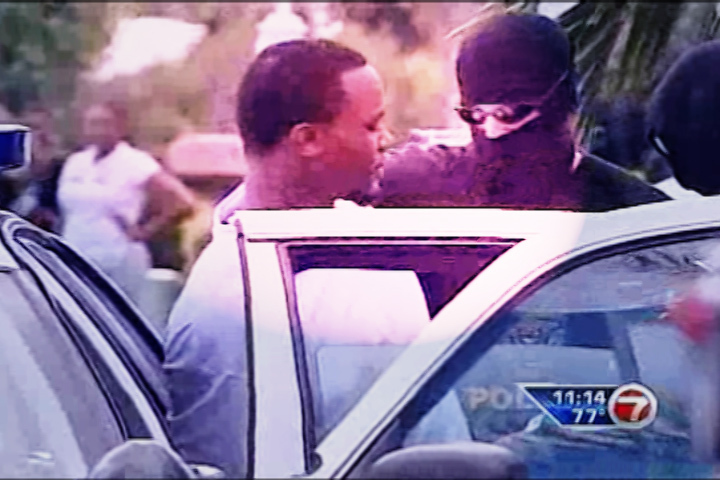 See WSVN - Unlicensed Operator Raid - Fort Lauderdale below. Case 4 - Cars With Defective Keyless Entry Systems - It was a mystery no one could solve — until now. For months, dozens of people could not use their keyless entry systems to unlock or start their cars whenever they parked near the Hollywood Police Department. Once the cars were towed to the dealers, the problem miraculously disappeared. Police have since cracked the case. Turns out the problem wasn't with the cars, the batteries or even user error, but an illegal pirate radio station that was jamming the signal from keyless entry systems of several makes of cars, including Lexus and Toyota. The man behind the bootleg operation likely had no idea it would lock people out of their cars, police say. Read more here. * Fort Myers FL: Patrick Michael Ford, also known as Disc Jockey “Joker” is hit with a notice of apparent liability for the standard $10K for operating on 95.7 MHz. * Fort Myers FL: Alex Alcime, also known as Disc Jockey “Short Dawg” is hit with a notice of apparent liability for the standard $10K, also for operating on 95.7 MHz. * Miami FL: Antonio Robinson hit with $10K NAL for operating a station calling itself Hittbreaker Radio. It was operating on 105.5 MHz. *San Jose CA: Gabriel A. Garcia: Hit for operating on numerous frequencies, from numerous San Jose locations, calling the station KNRG. When FCC agents traced a signal on 93.7 MHz to its genesis, a request to inspect the station was denied. On another inspection attempt, according to the FCC, “Garcia refused and stated to the agents, ‘Do you want to get shot?’” For all of these reasons the FCC found his violation to be egregious and jacked the fine up to $25K. Penalties can be steep for illegal operations in the broadcast bands. Under Florida Statute 877.27, the operation of an unlicensed transmitter is a third degree felony A conviction of a felony of the third degree, can lead to imprisonment for up to 5 years. In addition, at sentencing the court of any authority can confer by law to decree a forfeiture of property, suspend or cancel a license, remove a person from office, or impose any other civil penalty. Such a judgment or order may be included in the sentence. In addition, an automatic fine of $5000.00 is imposed. The defended shall also be liable for court cost. In addition, to violating the state statutes, by transmitting on broadcast frequencies without a proper license, a person or organization will have violated a number of Federal Laws and Regulations. Under the USC Volume 47 Section 301 and other sections, the Federal Communications Commission is given authority to issue fines, penalties, imprisonment and forfeitures. Such penalties typically are more than $5000.00 per occurrence plus imprisonment for up to one year for the first occurrence. A list of some forfeitures that have been order against individuals and organizations in the state of Florida can be found below. The first step is building a list of pirated frequencies and transmitter locations. Please include any and all supplemental information that may be helpful to the Law Enforcement or the FCC. Of particular interest is any connection with drug trafficking, gang activity or other crimes that would make a given pirate a “bigger fish” to Law Enforcement. A surprising amount of information can be found just by asking your employees, professional associates, friends and other acquaintances. A brief email soliciting information may yield a dozen or more valuable tips. Upon completion of the web site questionnaire, please send the same information to Reginald R. Garcia, FAB Attorney, reggiegarcialaw@yahoo.com. He will assist with local law enforcement and FAB will coordinate with all parties to ensure that this notification does not get lost in the system. Finally, please forward a copy of your information to us - SBE53. You can read about how one local Miami radio station, Call FM, tracks down illegal radio stations. Click here to watch the action. or mobile device. Can your first-aid kit handle this situation?